When I first had the idea for the “One Man, Many Bands” concept, Ethan Luck was in the first batch of guys that came to mind. You could easily toss out Kevin Bacon and play a “Six Degrees of Ethan Luck” game with just about any band from the Christian punk/alternative music scene of the 90’s to now and he’s still adding degrees as we speak…type…whatever. 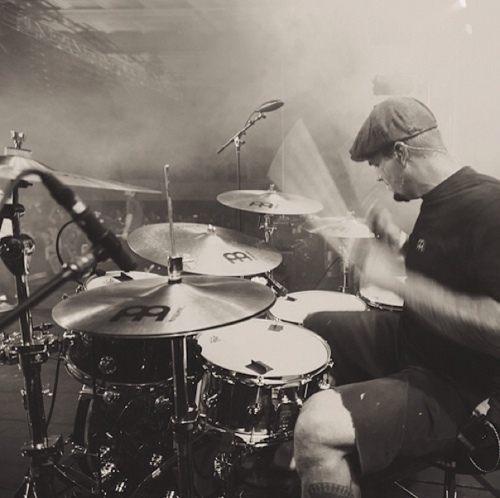 Currently, his main gig is drumming for Relient K, but he has contributed guitar, lap steel, bass, drums, engineering/production work and even vocals for an insane amount of bands that he was either a member of or just friends with. I’m not sure even Ethan could draw out his “band family tree” perfectly, so I’ll do my best to just hit some of the main ones. The Dingees – Although Ethan was in a few bands before The Dingees (including early incarnations of The O.C. Supertones and Pax 217), this was my first introduction to him. During the third wave ska craze of the mid to late 90’s, there were very few bands that nodded back to the 2 Tone and traditional ska that came before them. The Dingees could bring the punk flare when necessary, but their use of dub rhythms, horns and organ gave them that standout edge. Ethan’s drumming ability allowed them to play within different genres fluidly and I think that gave them something different from other bands of the era. Along with Rancid, MxPx and Dropkick Murphys, The Dingees were one of my “go-to” bands when I wanted to show my fellow classmates what awesome punk/ska music could sound like. After seeing The Dingees a few times in concert and them recording an awesome Christmas song (a sure-fire way to reach my musical heart), I was hooked. The O.C. Supertones – Between great albums and incredible live shows, The Supertones were an incredibly big part of my high school years. I straight wore out Adventures of the O.C. Supertones and Supertones Strike Back and I got my first “concert concussion” at a MxPx/Supertones/SpudGun show in 1997. So, when Ethan joined up with them on guitar in 2000, it was an exciting fit for me. Ethan’s first album with them was 2000’s Loud and Clear and he played all the way through to 2005’s Faith of a Child, appearing on six albums in all. Just like with The Dingees, Ethan’s ability to effectively play within different genres allowed The Supertones the opportunity to mess around with ska, punk, rap, soul and rock. I got to see Ethan play with The Supertones on a few different occasions, with the best one being Bleach’s (not exactly) final show in 2004 in Nashville. (Bonus Band) Motorhome - On the side, Ethan fronts Motorhome, a very cool country band that covers heavy metal songs. We're talking Maiden, Metallica, Slayer and Anthrax via stand-up bass, railroad drums and rockabilly guitar. They've only played a few shows here and there but if you get the chance to see a show, DO NOT MISS!! Here's a video of their "Tear In My Beer" take on Metallica's "Master of Puppets."